Most common garden annuals and perennials need abundant sunlight to grow well, and areas of the garden that are deprived of consistent, direct sun are inhospitable to many plants that are easy to grow elsewhere. Shade gardens present challenges beyond light levels, as well, but proper garden preparation, the right choice of plants, and the correct ongoing maintenance can turn even shady locations into lush gardens. Not all types of shade are created equal, and understanding the nature of shade in your garden will help you to choose the right plants. Areas of partial shade are blocked from direct sunlight for part of the day, but they do receive direct sun for some period of time, often between two and six hours per day. Areas of light shade or dappled shade are shielded from direct sun but receive some filtered or indirect sunlight. Areas of heavy shade are consistently shaded by structures or other impenetrable light barriers, but they may receive some indirect, reflected light. Areas of dense shade receive no direct or indirect sunlight. As you make plant choices, take note of the plants' specific light needs, and choose plants that will be able thrive in your garden's conditions. Shade-loving plants in general prefer well-drained but moist, organically rich soil. To improve the nutrient content, texture and water retention characteristics of your soil, add compost, peat moss or composted manure to the garden bed. If the existing soil is particularly heavy and poorly drained, consider adding one part sand along with two parts compost. In addition to the shade tolerance of garden plants, consider the color and texture of foliage and flowers as you choose plants for the shade garden. Many shade perennials bloom early in the season, so the garden will depend on foliage for visual interest during the later parts of the summer and early fall. 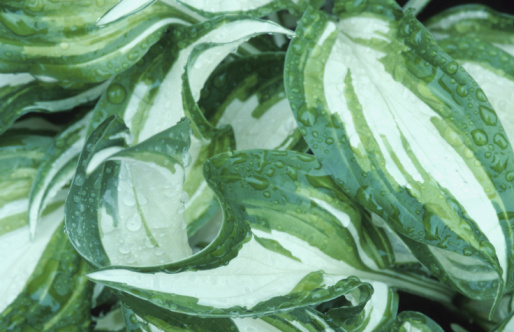 Light-colored, variegated and interestingly textured foliage stand out well in the shade, as do white or light-colored flowers. Among perennials, astilbe (Astilbe x arendsii), bleeding heart (Dicentra spectabilis) and hosta (Hosta spp.) are reliable choices for shade gardens. Astilbe is hardy in U.S. Department of Agriculture plant hardiness zones 4 to 9; bleeding heart and hosta are hardy in USDA zones 3 through 9. Shade tolerant annuals include coleus (Solenostemon scutellarioides), impatiens (Impatiens walleriana) and wax begonia (Begonia semperflorens). Access to water can be problematic for plants in a shade garden. When the shade is created by an overhanging structure or an especially dense tree canopy, very little rainfall may ultimately reach the ground in the garden. The moisture that does make it into the soil can be quickly drawn up by the extensive established root systems of trees and shrubs with which garden plants can have a difficult time competing. Monitor soil moisture carefully to be sure that the garden does not dry out, and water consistently. Shade gardens also benefit from regular light fertilization. Fertilizing with a balanced garden fertilizer each spring and twice more during the season will give garden plants vital nutrients that they might not otherwise be able to get as they compete with trees and shrubs. Do Pansies Like Direct Sun?